Connection and intimacy onstage are so important for improv. Through them, we convey deeper relationships, increase stakes, and ground scenes. In this workshop, we’ll focus on skills for creating both subtle and overt intimacy, saying “yes” and “no” to intimacy offers, and empowering players to create safe spaces for themselves and others. 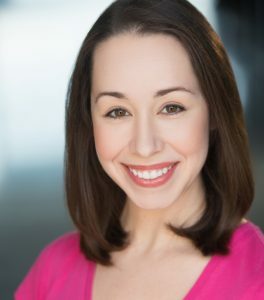 Megan Sherrod is a classically trained singer, actor, and improviser in Austin, Texas. On stage, critics have called her “charming” and said her “vulnerability is manifest and moving.” She performs regularly with her duo Megan and Quinn and her modern musical troupe Rook. With Rook, Megan has performed and taught at festivals locally, regionally, and nationally. She performed in improvised productions such as the awarding-winning Nothing and Everything: Improvised Anton Chekhov Plays, the wildly popular Happily Ever After, and local favorite Austin Secrets. Outside of performing, Megan regularly teaches and directs improv. She has taught masterclasses and workshops locally and abroad as far away as New Zealand. She recently directed the return of Hideout Theatre’s hit musical show Happily Ever After: Improvised Musicals Inspired by Disney Classics as well as Wonderland. As a teacher and a director, Megan looks for opportunities to strengthen and deepen character and relationship skills and provides a fun atmosphere full of direct feedback and support. $30 / 2.5 hours / Limited Space **Class held at The Hideout Theatre – 617 Congress Ave.